I’ve been hearing a lot from owners of smaller agencies about the challenges they are facing with growing their companies, so I thought it would be great to talk to some of these owners about their most pressing issues. Eleven years ago I went into partnership with the owner of a listing site here in Ontario. Craig had been running CottageLINK since 1995, and it was going well but he was regularly turning away property owners who wanted a management option. I was managing four of my own places and had been approached by a few other owners who liked what we were doing and wanted to jump on our bandwagon. So, we started with seven cottages, and with a few referrals from CottageLINK grew to 30 over the first two years. Now at around 180 properties in our rental program, I can look back and see all the things we could have done differently. So, I wanted to find agency owners from around the world who are in the early stages of growth, find out what works for them and what doesn’t and see what’s common amongst them. Nick Marshall opens this new series of interviews. He’s an expat Brit who left the UK in 1974 to seek his fortune in Australia, by way of a tiger sanctuary in Nepal. The son of a racehorse trainer, Nick says he learned the art of hospitality by serving gin and tonic to visitors to his family home…in the true British tradition. 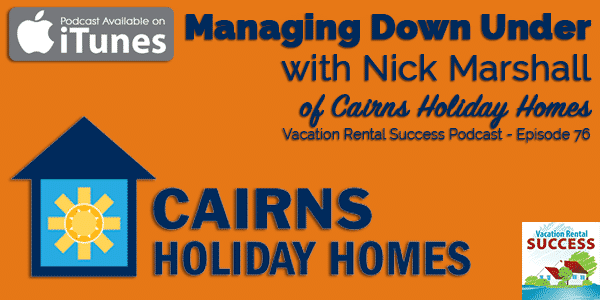 Nick and his wife Lizzie made their home in the Australian outback, 6 hours from Cairns where they built a wilderness lodge and 10 cabins, but the need to school children brought them closer to the city where they are today. When the children grew older and no longer wanted to spend time in the cottage Nick and Lizzie had bought, they began to rent it out, and word of their success spread, so friends started to come on board. Since 2005, they have been growing their small agency business and now have 30 properties under management. Nick shares what this growth means to them, the challenges they have faced and how he’s working on his goal to triple his business. Great and very interesting podcast with Nick! I’ve been in business since january 2014 and see I have so much in common with Nick. Looking foward to your next podcast Heather!